Welcome to the center of the universe. A stones throw from the Ball Drop, W New York - Times Square is in the heart of the theater district, with many of the citys renowned museums a few blocks north and sultry downtown a quick subway ride away.Spot tomorrows celebrity headlines over James Gerstens exquisite cuisine at Blue Fin, then mix it up in our Living Room as the DJs beats pulse into the night. Six state-of-the-art event studios total 2,300 square feet and adapt to your every need.Retreat to rooms that quiet the citys roar to a purr. The open showers, breathtaking skyline view, W signature bed with 350-thread count sheets, and lush robes in our 509 guest rooms and 43 suites make staying in a statement, not a question. What now? (there are so many possibilities) This is it. The Big Apple. Times Square. People everywhere. Hustling. Bustling. The pulse of the city. Alive. Feel the energy as you make your way to the newest W in New York. Welcome to W New York - Times Square. Steps away from Broadway theaters, Fifth Avenue Shopping and international businesses. Escape the crowds and unwind over a specialty cocktail from The Living Room Bar s menu that has been refreshed by indieFORK. 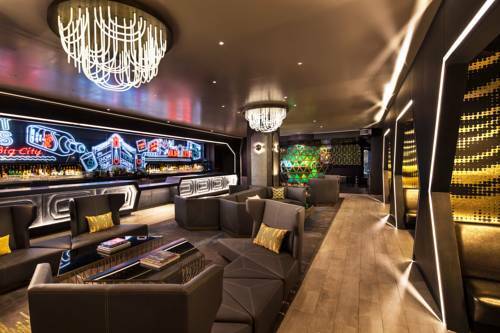 Hang out in a stunning homage to Times Square s styles and trends of decades past. Revel in Blue Fin s sleek new design by Robert McKinley. Step up to the street-level sushi bar led by Chef Boo Mike Lim, or ascend to the upper level s bar and lounge area, communal table, and expanded private dining rooms. Indulge in Chef Ivy Stark s authentic Mexican dishes at Dos Caminos, designed by Brooklyn-based hOmE. Take a seat at the street-level mezcal and margarita bar, or head up to the main floor s guacamole bar, DJ area and private dining space.